Πατήστε τη φωτογραφία και δείτε όλες τις φωτογραφίες του Treebo Baljeet Lodge. 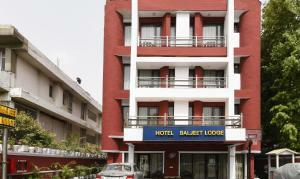 Treebo Baljeet Lodge is set in New Delhi, 5 km from Qutub Minar, and features free WiFi. All rooms feature a flat-screen TV with satellite channels and a private bathroom. The property is 5 km from Rashtrapati Bhavan. The rooms in the hotel are fitted with a kettle. All units include a wardrobe. Treebo Baljeet Lodge offers a à la carte or vegetarian breakfast. At the accommodation you will find a restaurant serving Indian cuisine. Speaking English and Hindi, staff are always on hand to help at the reception. India Gate is 6 km from Treebo Baljeet Lodge. The nearest airport is Delhi International Airport, 9 km from the hotel.